Paul Ryan had his way with the budget deal. And the economic pain is just beginning. When initially discussed as a rude repercussion of a bungled budget deal, the prospect that 1.3 million Americans would lose long-term unemployment benefits just days after Christmas was bad enough. Imagine a country that during the week between Christmas and New Year’s Day abandons those hit hardest by economic turbulence, and you have a sense of what the United States has become under the cruel hand of House Budget Committee chairman Paul Ryan—who refused to agree to any budget deal that included an extension of benefits—and those members of Congress, Republicans and Democrats, who compromised with the failed Republican vice presidential candidate’s austerity agenda. Because Congress accepted Ryan’s crude calculus, 1.3 million jobless Americans were abandoned on December 28 by a government that could, and should, have assisted them. And if Ryan continues to get his way, unemployment benefits will end in coming months for an additional 1.9 million Americans. He is off the mark, morally and economically. Sanders correctly points out that there is no sound economic argument for adopting the Ryan approach. A continuing refusal by Congress to extend benefits has the potential, according to the nonpartisan Congressional Budget Office, to cause a $25 billion blow to the economy in 2014. The CBO projects a 0.2 percent drop in the nation’s gross domestic product—and the loss of 200,000 additional jobs—unless the benefits are extended. In other words, this is cruelty for the sake of cruelty. There is little debate that Ryan defined the scope and character of the budget negotiations that played out in November and early December. Yes, he would have gone further if Senate Budget Committee chair Patty Murray (D-WA) and other Democrats had not been in positions to constrain his ambitions. But Ryan bragged that the deal reflected his bottom line: no new taxes on the extraordinarily wealthy, no closing of loopholes for corporations, no economic stimulus, continuation of many of the worst of the sequester cuts and an austerity calculus that unburdened billionaires. Though Murray and many of the leading lights of the Republican and Democratic caucuses in the House and Senate were involved in the budget negotiations, Ryan was the definitional player. And he shaped a plan that embraces his fiscal ethic of erring consistently on the side of Wall Street speculators, “golden parachute” CEOs and million-dollar campaign donors. When Ryan is done delivering for his core constituencies, there’s little left for working Americans—and even less for out-of-work Americans. Pocan, a former co-chair of the Wisconsin Legislature’s powerful Joint Finance Committee and a member with Ryan of the House Budget Committee, is recognizing reality. The budget deal fails to demand that the primary beneficiaries of the federal policies that Ryan has helped shape for more than a decade—bailed-out banks, border-hopping multinational corporations and billionaires seeking tax shelters—do anything more to reduce deficits and debts. Instead, it shifts the burden to federal workers and military personnel, who were hit with a demand that they pay more for basic benefits. The cruelest calculus comes now, after December 25, as 1.3 million Americans are denied assistance that they need to pay for shelter, food and the transportation they use in searching for jobs that in many parts of the country just aren’t available. Roughly 28,000 Wisconsin families, including many residing in Janesville, Ryan’s hard-hit hometown, are among those slated to lose benefits. 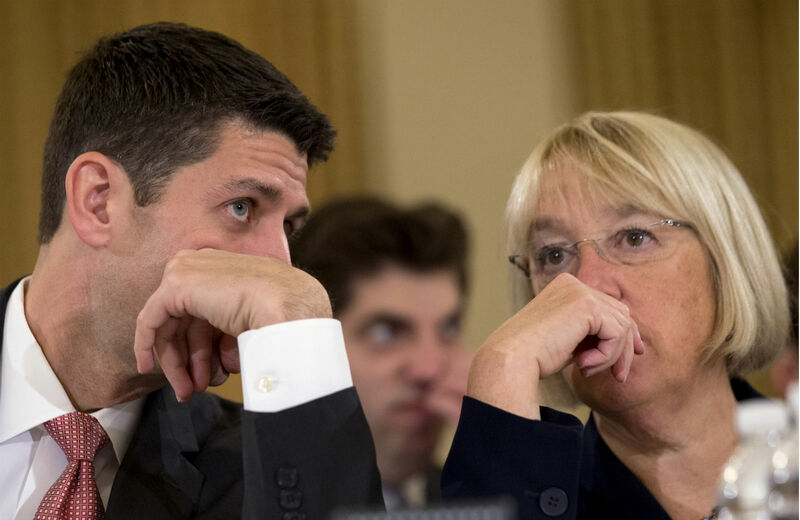 Paul Ryan and Patty Murray had every opportunity to include an extension in the agreement. Democrats were angling for it, and Republicans were unlikely to balk at a proposal to help the needy in the holiday season. Yet when the plan was presented, no provision was made for the long-term unemployed. Despite Democratic objections prior to the House and Senate votes, the measure advanced with overwhelming support from compromise-prone members of both parties. And it was signed by the president on December 26. Then they hightailed it home for the holidays. Politicians are rarely so crass in their language. Yet the budget deal Paul Ryan did so much to shape, and that too many Republicans and Democrats endorsed, contains precisely nothing for those whose want is keenly felt. The question now is whether Congress will be shamed sufficiently to act. There are certainly those who are ready to respond. On January 6, when the Senate reconvenes, Senate Majority Leader Harry Reid (D-NV) says the first measure up for consideration will be a plan to restore long-term unemployment benefits. The measure is backed by Nevada Republican Dean Heller and twenty-one members of the Senate Democratic Caucus. Give Heller credit. He is doing the right thing—for his constituents and for the national economy—by breaking with Ryan and the austerity agenda. Put another way: How many Republicans will join Heller in recognizing that the circumstance of the long-term jobless is their business? Indeed, it is all of our business.